We've been talking a lot lately about the steps you can take to make sure your pet is a healthy weight. And with more than half the dogs and cats in the country classified as obese or overweight, healthy eating -- and in the correct amount -- is an important topic. We find that sticking to a consistent routine -- with both exercise and feeding -- is one of the most important things you can do to keep your pet, and yourself, healthy and happy. But sometimes life gets in the way... you get home late from work or maybe you have too many cooks in the kitchen (translation: your pet gets fed dinner twice because more than one person in the household is doing the feeding!). Because of all these reasons, when we heard about the new automatic pet feeder from PetSafe, the Healthy Pet Simply Feed, we thought it was worth a look! 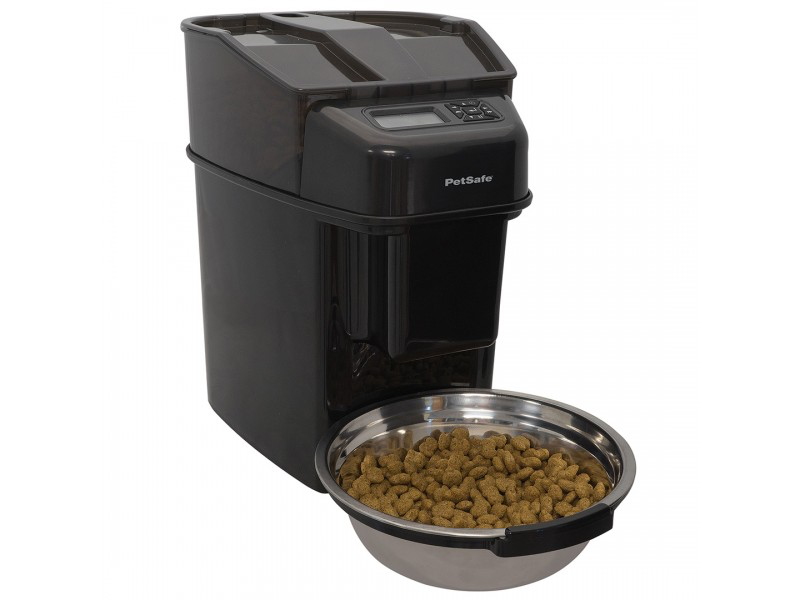 Using an innovative conveyor system, the feeder consistently controls the amount of food dispensed for your pet. There are pre-set meal options for both dog and cat, or you can set your own portion size (meal portions are adjustable from 1/8 cup to up to 4 cups in 1/8-cup increments). This is perfect for folks who think a heaping cup is the same as a level cup! Keeping your pet on a consistent feeding schedule can help keep things regular... meaning no accidents or 3 a.m. potty breaks. You can customize the times you feed, whether it's twice a day or up to 12 meals a day for pets with special needs. The feeder comes with a stainless steel bowl and most of the parts are dishwasher safe or hand washable. The Slow Feed option dispenses meals over a 15-minute period to help prevent bloat and vomiting with pets that gulp or eat too fast. The 24-cup food capacity hopper means you'll need to refill it less often, and it's translucent so it's easy to see when the food level gets low. 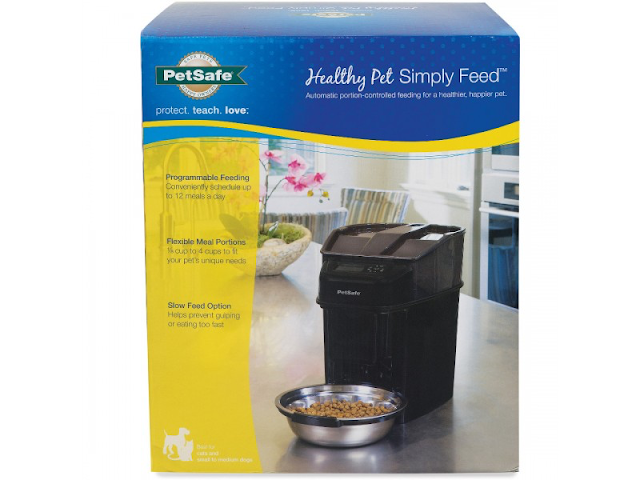 The Healthy Pet Simply Feed is priced at $149.99 and is available for purchase on PetSafe.net and at authorized retailers. Rocco will be trying out some of the special features offered in the Healthy Pet Simply Feed during the next few weeks and we'll be back to tell you how it goes. I'm particularly interested in the slow feed option and how Rocco will react to that. He is a SUPER FAST eater so it will be interesting to see how patient he is! 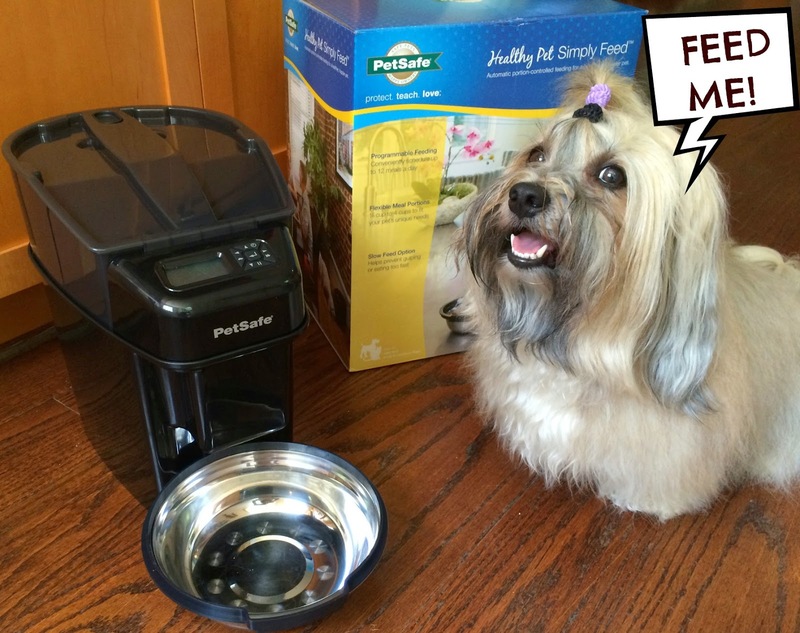 Have you ever thought about trying an automatic, portion-controlled feeder? We were provided with a Healthy Pet Simply Feed for review. All opinions expressed herein are our own. For a one dog family, that would be a great tool! That's a great point! Rocco would go around and eat every one else's schedule meals if there were more than one. It would be hard for us with three dogs, plus we wet their dry food and mix in supplements and yogurt. I do like the slow feed option. We do one meal a day with supplements and wet food, but the other meal is dry so we'll schedule one meal a day. This is a great idea! I haven't seen it before and love new products. This looks like a really neat product! Thanks for sharing! This sounds like a great tool for helping busy doggie parents out! We no longer feed kibble since we transitioned the pups to a homemade diet, but I like the idea of this feeder! It sounds neat for people who have one dog and feed kibble. Mr. N eats raw and you wouldn't want that sitting around all day. We also use frozen green beans to help Rocco feel full. He thinks those are a great treat! that would be awesome for a one dog household. Have a great weekend. That's awesome! I've always thought that would be a great idea and am ecstatic to see it as a real product! I don't think this would be very good for a multi-dog household though, unless said multi-dog household had its dogs separated all the time already and then put the auto feeder in the respective areas or rooms. Yes, each dog would need their own private suite! ... not a bad idea! How are you ? I was seen the post (Happy Birthday Rocco From Fido and Fluffy's Freebie Friday), This really nice picture. Thanks.